It’s that time of year again, Kwanzaa time! And how do we celebrate this great season? By talking about Christmas movies of course! The story is a re-imagining of the classic A Christmas Carol by Charles Dickens. Released in 1983, the movie still holds up today and if I am not mistaken is the introduction of Scrooge McDuck who would later go on to star in another classic from childhood, Duck Tales. This used to be a staple on the Wonderful World of Disney during December but it’s been years since I have seen it on TV. However, thanks to the internet I can now watch it whenever I want! Thanks internet! There will be something nice in your stocking this year. What’s that? Oh, I had no idea you were Jewish! Happy Chanukah! Scrooged is a movie I was a little late to the game on. I always remember seeing posters for it in video stores or ads for it on TV but I didn’t watch it until I was about 17 and it changed my life…well at least the part of my life where I watch Christmas movies. I was working at a video rental store and the staff would take turns putting whatever movies they wanted to watch. On a particularly slow night, a co-worker of mine put on Scrooged and I was BLOWN away! This is one of Bill Murray’s best movies (and with his resume that is saying a lot). 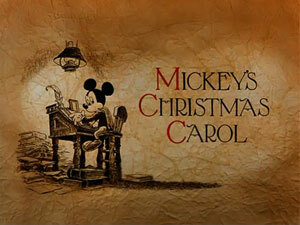 It is once again a re-imagining of A Christmas Carol but told in more of a modern (modern 1988 that it) storyline. This movie is hilarious yet still manages to capture the charm and warmth of Christmas. Do yourself a favor and watch this movie this Christmas season! While I’m sure more than a few of you have seen Mickey’s Christmas Carol and Scrooged, I would bet the majority of you have NEVER seen The Ref and that’s too bad because it is a fantastic Christmas movie. While it isn’t your traditional Christmas flick, it’s satire and crude language is a nice break from watching movie after movie of family fun loving Christmas stories. I’m not sure why this movie didn’t catch a bigger cult following, it could be the fact that the production company didn’t release it until St. Patrick’s day back in 1994 and who wants to go to a Christmas movie in March? If you are looking for something a little more out of the box this season, I would highly recommend The Ref. So those are a few of my underrated Christmas movies. Feel free to argue or share yours with us, after all, it is the season of giving. Merry Christmas! Scrooges is one of my favourite Christmas movies. In fact I think I might just put it on right now! Haha, I was about to make the same comment that I made almost the same time this time last year. How spooky!